Yesterday, on a cozy Sunday afternoon, the first cool and cloudy day in Seattle in 40+ days L. and I curled up on the couch to watch "Titantic." Watching this film on Blu-ray is an experience, almost as good as seeing it in the theatre but when you count in all the extras, L. and I both agreed it was even better than when we saw it first time in on the big screen. Winning 11 Academy Awards, this 1997 blockbuster tells the story of Rose (Kate Winslet), a young wealthy woman who boards the Titanic with her mother Ruth (Frances Fisher) and fiance Cal (Billy Zane). On this historic ship she meets and fall in love with a young, poor artist named Jack (Leonardo DiCaprio). Moviegoers fell in love with the epic story as Rose now 101 years-old flashes back to that fateful night 84 years before on the night of April 15th, 1912 when the Titanic, the unsinkable ship sank. When this film first released in 1997, I remember how this movie was universally loved by the critics and audience. 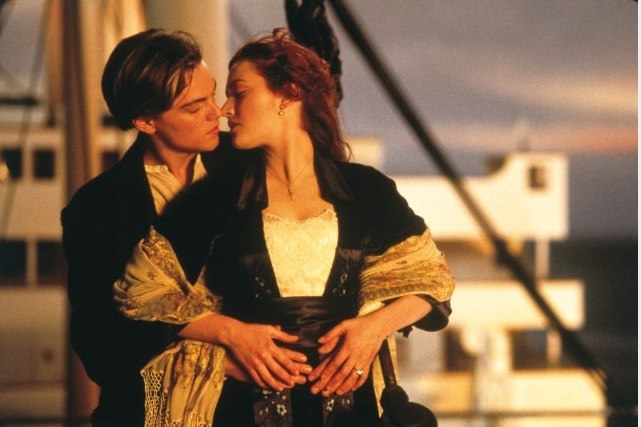 For a story with such an awful ending, it captured the hearts of everyone who saw it and each time thereafter when you heard "My Heart Will Go On" (the theme song by Celine Dion) it was impossible to not feel a twinge of sadness for Jack and Rose. credit Merie Weismiller W (c) 2011 Paramount Pictures and Twentieth Century Fox. All Rights Reserved. While the movie stand the test of time well, I'm a sucker for behind-the-scenes extras and this Blu-Ray combo pack has over 2 1/2 hours of special feature content including never before seen documentary footage produced by National Geographic with interviews with some of the world's leading RMS Titanic experts. There are also 30 deleted scenes, 60 behind-the-scenes featurettes, 2000 still photos, three commentaries and more. There are the expected extras like the trailers and TV spots, music video "My Heart Will Go On" by Celine Dion and commentaries but my favorite featurette was "200,000,001: A Ship's Odyssey," the "Titanic" crew video featuring cast and crew before or after the cameras were rolling. They're silly, they're hanging out, they're keeping themselves amused during long days and nights. Having covered dozens of set visits, some of my most memorable times on set were between scenes when cast and crew played cards, learned to juggle or just took a break sitting in costume eating watermelon on a hot summer's day in a remote location. It's when you really get a feel for the production. With such a huge undertaking for this film, it's clear this cast and crew learned how to have fun during the breaks. 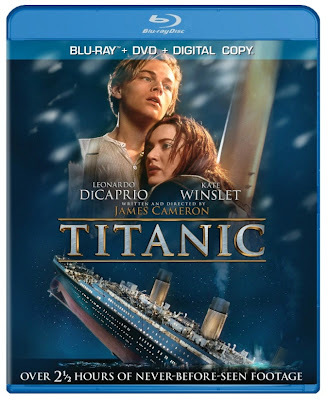 If you like going behind-the-scenes, you'll really love this featurette including Leonardo DiCaprio (Jack), Kate Winslet (Rose), James Cameron (Director), Billy Zane (Cal), Kathy Bates (Molly), Frances Fisher (Ruth) and Gloria Stuart (old Rose). If you're more like my husband, you'll appreciate all the technical featurettes from the construction time-lapse, the Deep Dive Presentation with James Cameron, Visual Effects, and Videomatics. It was fascinating to see just how technical James Cameron and his crew went in building the small models prior to building the actuals sets. With the air turning crisp, pick up the new "Titanic" Blu-ray packs and spend an evening celebrating the great love of Jack and Rose.